The Porto Atlântico urban renewal project was a massive endeavor that relied on PENETRON crystalline technology to ensure its below-ground structures would remain impermeable. Despite its magnitude, the project was completed in two months. Rio’s massive urban renewal project, Porto Atlântico, relied on PENETRON ADMIX to ensure permanent protection against high hydrostatic pressure of groundwater in all concrete basement slabs. Even with a waterfront location and its high water saturation levels, PENETRON ADMIX proved to be effectively stable to resist water under pressure. This extensive development project in the Porto Maravilha area of Rio de Janeiro is one of the city's oldest and most historic areas. After a long period of decay, the region has become a magnet for investment and new construction. “This massive urban revitalization effort will boost the entire waterfront area of Rio de Janeiro, creating a new center of commercial and residential growth,” adds Jozef Van Beeck, Director, International Sales & Marketing of PENETRON International. 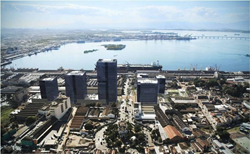 Beyond construction of new buildings, the Porto Atlântico project also upgraded and modernized all infrastructures (including roads, sidewalks, utilities, sewage, and more) as part of the largest public-private partnership in Brazil to date. New building construction is LEED-certified (Leadership in Energy and Environmental Design), which confirms the sustainability criteria applied in the design during construction and in all aspects of project logistics. All concrete basement slabs of the hotels and commercial towers were treated with PENETRON ADMIX to provide permanent protection against the high hydrostatic pressure of the groundwater. In addition, as an environmentally friendly construction material with a 0% VOC content level, PENETRON ADMIX contributed additional LEED points needed for LEED certification.